The classroom is only the beginning of education. Recognizing this, the School of History, Philosophy, and Religion at Oregon State is also committed to bringing top scholars and innovative educators from around the world to enrich our programs with fresh ideas and perspectives. 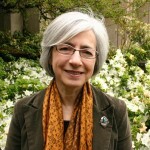 In fact, between the Horning and Hundere Endowments, the Spring Creek Project, the Phronesis Lab for Engaged Ethics, the Peace Studies Program, the Carson Lectures, the Holocaust Memorial Program, the Chun Chiu Conference Series and the Anarres Project for Alternative Futures, SHPR sponsors more events for its students and faculty each term than any other school at Oregon State. 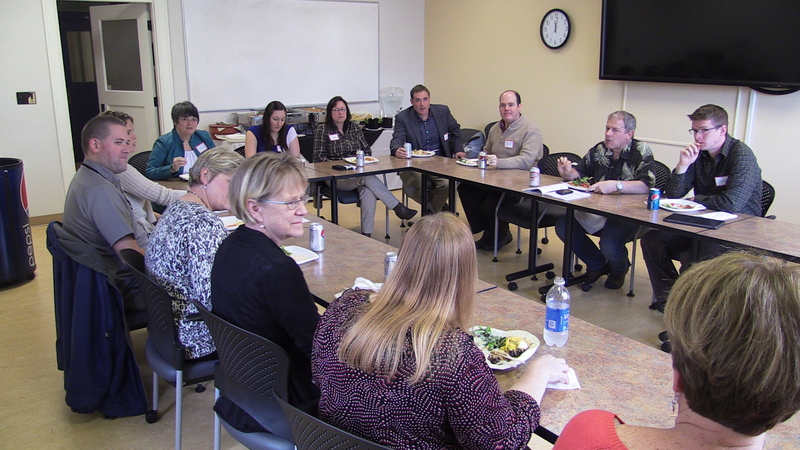 During Winter Quarter, SHPR – in cooperation with the City of Corvallis and the larger OSU Pauling committee – brought John Hunter to Oregon State for the Ava Helen and Linus Pauling Memorial Lecture. 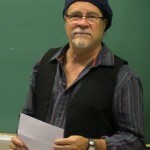 Master teacher and creator of the World Peace Game, Hunter shared the subtle mechanics of his geo-political simulation, how it has for 35 years proved to be a successful interdisciplinary classroom tool, and why now his work has been hailed as a tool for peace by institutions ranging from the US Pentagon to the United Nations. Hunter is author of the 2013 book and award winning documentary entitled World Peace and Other Fourth Grade Achievements. The Spring Creek Project for Ideas, Nature, and the Written Word also had an amazing Winter quarter hosting a number of interesting programs including a presentation by author Julian Hoffman, Winner of the 2012 Association of Writers and Writing Programs (AWP) Series Prize for Creative Nonfiction, and a two day symposium entitled Transformation without Apocalypse: How to live well on an altered planet that brought well over a thousand people to the Oregon State Campus. This event included lectures by a host of luminaries including Oregon award winning writer Ursula K. LeGuin, Kim Stanley Robinson, Kathleen Dean Moore, Joanna Macy, and Tim DeChristopher as well as a film festival, several interactive workshops, and a community action fair allowing attendees to instantly turn inspiration into action. 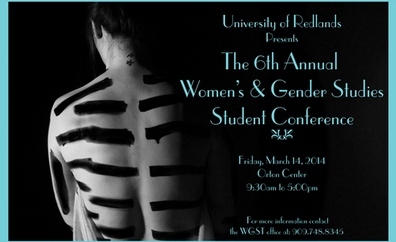 There were many great presentations and it was difficult to choose one to highlight in this newsletter, but ultimately I chose to go with emeritus OSU philosophy professor, and former director of the Spring Creek Project, Kathleen Dean Moore – whose thoughtful and wonderfully descriptive words never fail to inspire. Sometimes our events produce unexpected dividends. 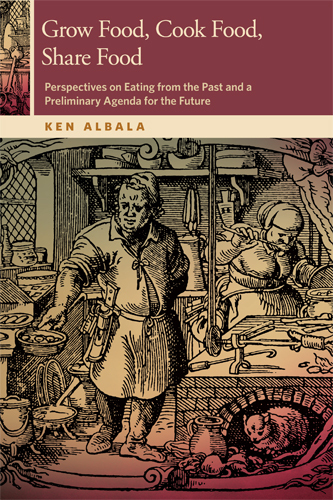 Last month at the 2014 Gourmand World Cookbook Awards, Ken Albala’s latest book, Grow Food, Cook Food, Share Food: Perspectives on Eating from the Past and a Preliminary Agenda for the Future, recently published by OSU Press, won best book in the category of Culinary History! This book was based on the lectures that Ken gave as Horning Visiting Scholar in the fall of 2011 at Oregon State University. 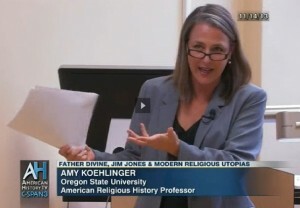 Thanks to C-SPAN, you can now sit in on a class with SHPR professor Amy Koehlinger! Originally taped during fall term, this class debuted on C-SPAN’s Lectures in History in February and aired several additional times during Winter quarter. In this class, Dr. Koehlinger looks at the idea of modern religious utopias, focusing on Father Divine’s Peace Mission Movement and Jim Jones’ Peoples Temple. Father Divine, who claimed to be the living incarnation of God, saw the rapid growth of his Peace Mission Movement during the Great Depression, when he’s estimated to have had as many as 50,000 followers. Jim Jones drew inspiration for his Peoples Temple from Father Divine. However, Jim Jones is best remembered for orchestrating the largest cult suicide in American history, with more than 900 members ingesting a cyanide-laced drink on Jones’ orders. C-SPAN will return to OSU during Spring term to film a session in Marisa Chappell‘s HST399 course Civil Rights Movement in Modern America that will air mid-summer. 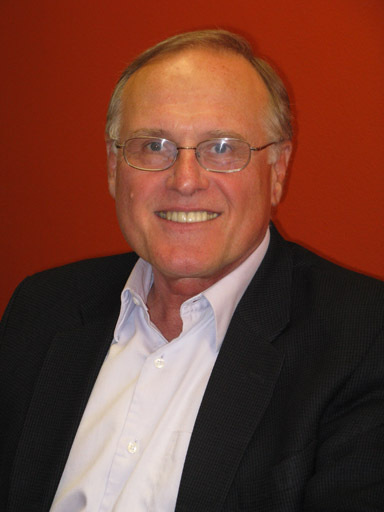 Many of our professors are internationally recognized leaders in their profession. 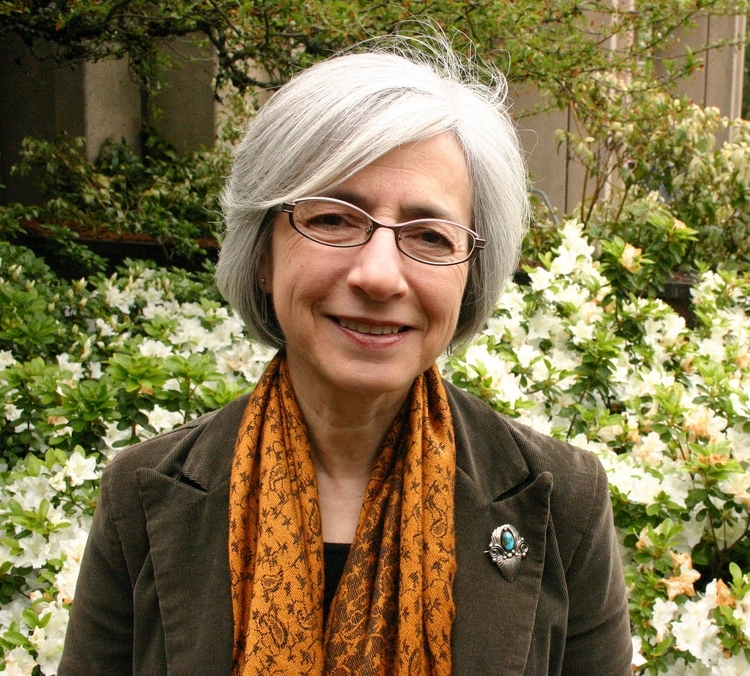 For example, in February, Horning Professor in the Humanities Dr. Anita Guerrini officially became chair of the American Association for the Advancement of Science (AAAS), History and Philosophy of Science section steering group. Guerrini assumed the role at the 2014 annual meeting of the AAAS which was held in Chicago, IL. Guerrini’s new book, The Courtiers’ Anatomists: Animals and Humans in Louis XIV’s Paris, has gone to press and will be released in March of 2015. She has recently began working on the history of the H.J. Andrews Forest Long-term Ecological Research site in Oregon. 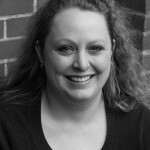 You can follow her work on the history of animals, science, and food on her blog Anatomia-Animalia. 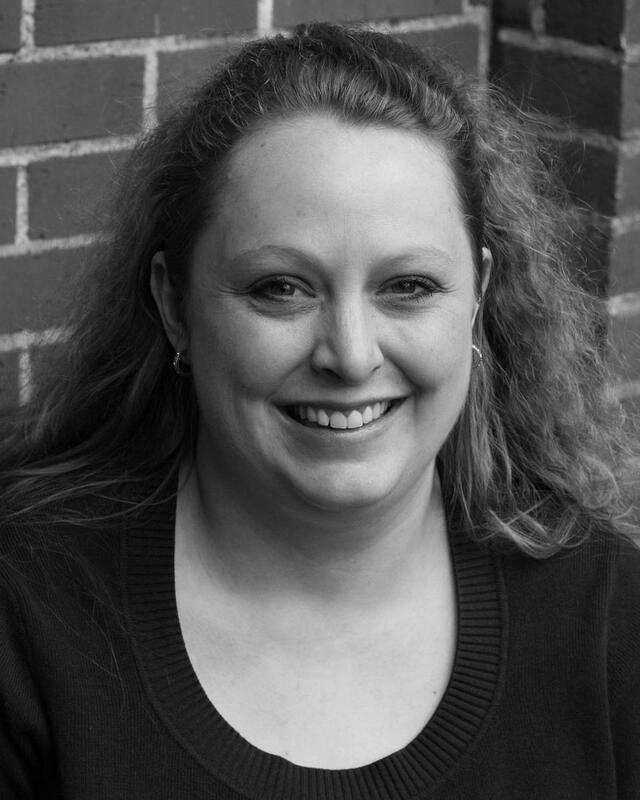 At their recent 2014 Annual Meeting, the Organization of American Historians presented Stacey L. Smith with the inaugural 2014 David Montgomery Award for the best book on a topic in American labor and working-class history. The award is given annually with co-sponsorship by the Labor and Working-Class History Association (LAWCHA). They said, “Smith’s impressively researched and beautifully written book, Freedom’s Frontier: California and the Struggle over Unfree Labor, Emancipation, and Reconstruction (University of North Carolina Press), reveals the various forms of exploitation of bound workers—African Americans, Chinese, Latino, Native American, and Hawai‘ian and child laborers—in the “free” state of California before, during, and after the Civil War. 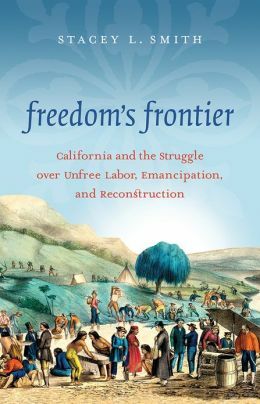 It expands our appreciation for how race, gender, and class exploitation shaped the American West and how that, in turn, constricted the nature of American freedom in the nineteenth century. This ambitious, thoughtful, well crafted, and deeply researched study provides a clear analytical framework that is worthy of the pioneering work of David Montgomery. It significantly changes the way we understand the American experience and deserves a wide readership.” We could not be more proud! Smith has also been working with the Oregon Historical Society to help create the latest exhibit at their museum. This original exhibit takes an in-depth look at Lincoln’s monumental presidency between two historic points: the enactment of the Emancipation Proclamation and the Congressional passage of the Thirteenth Amendment. 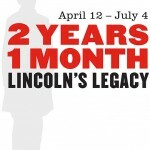 Through rare documents, artifacts, and cutting edge interactive elements, 2 Years, 1 Month will look at Lincoln’s legacy through the lens of slavery and the end of the Civil War. The exhibit will run through July 4th and you can get more information and tickets at the OHS website. SHPR Instructor Tony Vogt was awarded the 2014 Fances Dancy Hooks Award by the Martin Luther King, Jr. Planning Committee at the 32nd Annual Peace Breakfast in early Winter quarter. 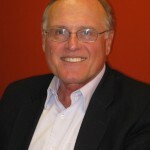 Tony’s commitment to the campus and the broader community particularly impressed the MLK Planning Committee and they specifically singled out “Tony’s high level of commitment to grassroots activism, community building, and his impact across diverse groups” as most exemplary in a competitive field of nominees. This commitment also helped to form The Anarres Project for Alternative Futures with Joseph Orosco. Inspired by the speculative fiction of Oregon writer Ursula K. LeGuin, the project seeks to bring together activists and scholars from the arts, humanities, and social and natural sciences who are writing, thinking, and teaching about the ideas and themes explores in her work including: gender, racial and sexual justice, ecological sustainability, bioregionalism, left libertarian / anarchist traditions, utopias & dystopias, alternatives to war, cooperative economic arrangements, and indigenous cultures and ways of knowing. 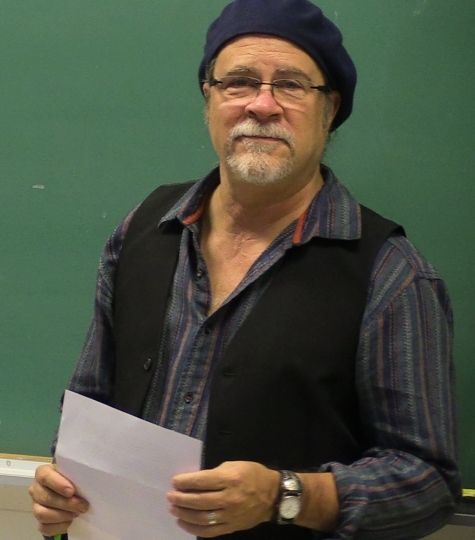 During Winter term, the Anarres Project sponsored several events including Anarchism and the Occupy Movement (with Nathan Schneider), Blood Avocados, Drug Cartels, and the Crisis of Democracy in Mexico (with Victor Vargas), and Until the Ruler’s Obey (with Clifton Ross and Marcy Stein) as well as several speakers that were part of the massive Transformation Without Apocalypse symposium organized by the Spring Creek Project including this inspiring talk by Susana Almanza. As a member of the board of the Professional Faculty Leadership Association, she has been working to develop a system of mentoring for Unclassified Professional Faculty. During winter term, Howard organized and hosted a luncheon, here in Milam Hall, to kick-start a mentoring program across the university. SHPR supports research at all levels and even our undergraduate students often have a significant research component. History undergraduate Brittany Backen was also lauded for her research work. She was awarded the Library Undergraduate Research Awards for her project and paper “Coed Cheesecake: The 1959 Wrestling Court and the Politics of the Marriage Market at Oregon State College.” This project grew out of the new “Hidden History of OSU” course taught by SHPR chair Dr. Ben Mutschler. Congratulations also go out to History of Science PhD student Barbara Canavan who won a Grant-in-Aid for research at the Rockefeller Archive Center in Tarrytown, NY. Barbara’s dissertation in progress is entitled, “Avian Influenza: Opening Pandora’s Box at the Roof of the World”. By means of historical analyses of avian influenza, a case study, and oral interviews with scientists, Barbara’s dissertation examines bird flu at the human-animal interface. Beginning with the “fowl plague” in the late nineteenth century, the dissertation examines change over time in how scientists came to understand avian influenza. In addition to his teaching and extensive research work, professor Jacob Darwin Hamblin has also been busy giving presentations around the country and around the world. He presented Catastrophic Environmentalism: War and Nature? 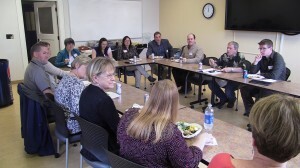 as part of the C-CHANGE Colloquium Series at the University of Kansas on February 21st. Two weeks later, on March 2nd, he presented a paper “A Glaring Defect in the System: Nuclear Safeguards and the Invisibility of Technology” at the Center for Security Studies (CSS) at ETH Zurich, Switzerland. Most recently, on Monday April 7th, Dr. Hamblin kicked off the Spring 2014 UCLA History of Science, Medicine, and Technology Colloquium presenting on his most recent book Arming Mother Nature: The Birth of Catastrophic Environmentalism. If you haven’t had a chance to see him present yourself, you are missing something special!! Hamblin will next be presenting Nukes, Oil, and Energy Strategies in Dangerous Parts of the World at the 3rd Annual Cultures of Energy Spring Symposium on April 24th at Rice University (which is open to the public!). 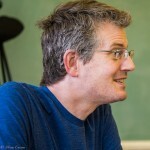 Horning Professor in the Humanities David Luft delivered the keynote presentation at the Austrian Studies Association annual conference in February. Luft, who is also a past president of the Austrian Studies Association, spoke on The Transformation of Austrian Intellectual Life: 1900-1938/1939. In early March, the third lecture in this year’s the Horning Endowment sponsored ‘Culture and Religion Series’ was given by Jennifer Ratner-Rosenhagen, author of American Nietzsche: A History of an Icon and His Ideas (University of Chicago Press). Her standing room only lecture explored the lasting importance and resonance of Nietzsche’s work in the United States. The annual film festival is the primary fundraiser for Crossroads International Programs. Crossroads International has promoted friendship and cultural sharing since 1969, current Crossroads programs include a 3-Day Homestay for incoming Oregon State University international students, a conversational English class for International women in the Corvallis area and a variety of events that promote cultural sharing throughout the year. 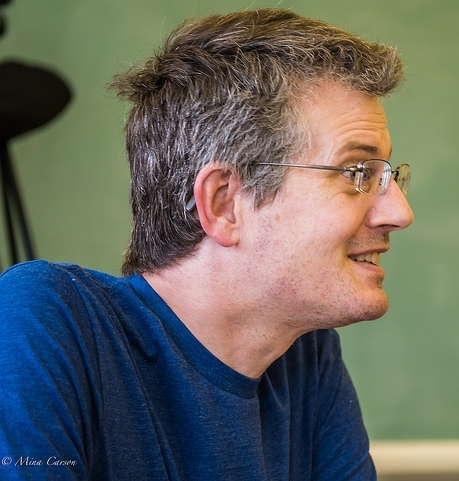 Nationally syndicated radio program Philosophy Talk, hosted by Stanford philosophers John Perry and Ken Taylor, returned to OSU to tape a discussion of privacy and national security issues in the digital age. 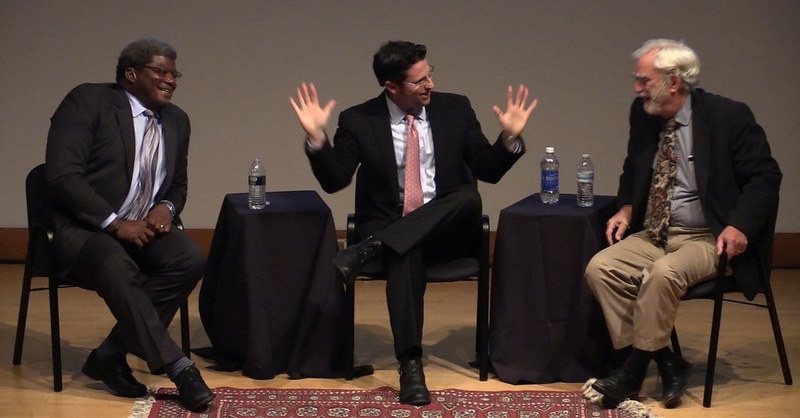 In a packed auditorium at the LaSells Stewart Center, together with Professor Christopher McKnight Nichols, they tackled a number of issues raised by Edward Snowden’s revelations of domestic spying by the National Security Agency, interspersing the debate with short video presentations and stopping periodically to take questions from the audience. The broadcast will air on public radio across the country in early Summer. 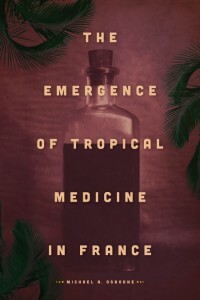 Michael Osborne‘s new book, The Emergence of Tropical Medicine in France, was released by University of Chicago Press in March 2014. Dr. Osborne has also been doing a bit of reviewing recently. You can read his review of Contagion: How Commerce Has Spread Disease by Mark Harrison (Yale University Press) published in the February issue of the journal Health Affairs. 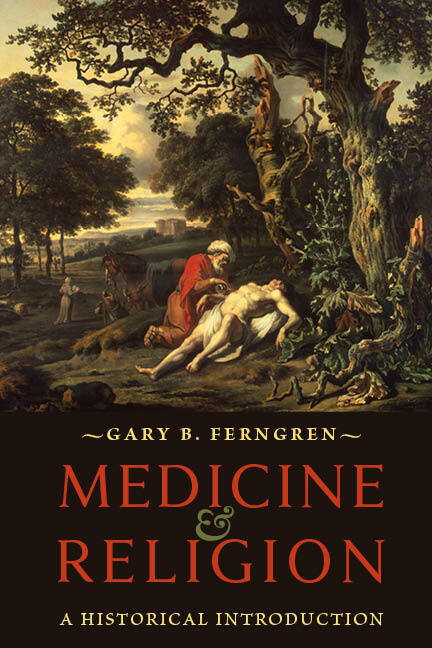 Gary Ferngren‘s new book Medicine and Religion: A Historical Introduction also hit the shelves during Winter Quarter. It is the first book to comprehensively examine the relationship between medicine and religion in the Western tradition from ancient times to the modern era. Beginning with the earliest attempts to heal the body and account for the meaning of illness in the ancient Near East, Ferngren describes how the polytheistic religions of ancient Mesopotamia, Egypt, Greece, and Rome and the monotheistic faiths of Judaism, Christianity, and Islam have complemented medicine in the ancient, medieval, and modern periods. Philosophy professor Jonathan Kaplan had a new article published in the February 2014 issue of the journal Biology & Philosophy. His article, entitled “Race, IQ, and the search for statistical signals associated with so-called “X”-factors: environments, racism, and the “hereditarian hypothesis?”, can be read in its entirety here. And finally, congratulations go out to Stephanie Jenkins, Nicole von Germeten, and Christopher McKnight Nichols who all received research grants from the Center for the Humanities (CftH) for academic year 2014-15. The Center for the Humanities, established at Oregon State University in 1984, is an interdisciplinary research center that grants Fellowships to visiting U.S. and international scholars as well as faculty from OSU. Late last year, we lost former history professor Hugh Wubben who taught at OSU for many years. Professor Paul Kopperman, who worked with Hugh in his early years, has kindly provided this wonderful recollection and memorial. 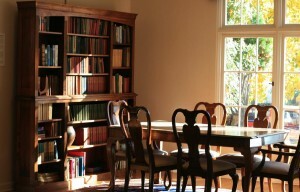 “I have many fond memories of Hu – in fact, nothing less than fond. He was one of my go-to people when I first arrived here in 1978, and I often ventured to his office (now Marisa’s) when I wanted someone to share ideas with. Hu was a veteran of the Korean War, though he seldom spoke of his service, at least to me. He received his Pd.D. at Iowa and promptly came to OSU. When I met him, he was long and lean, and always carried himself bolt upright – a posture that matched his character, in that he tended to be direct, though never disagreeable, on topics that interested him, particularly teaching technique. Hu was also quite athletic. Regardless of the season or the weather, he bicycled in; on rainy days, he covered himself with a large yellow slicker, which made him look like a tent on a bike. Once or twice a week, we would go to Dixon to play three-on-three basketball (Hu, Darold Wax, Don McIlvenna, Nick Yonker [from Religious Studies], Dave King, and myself). I can still see him going up for rebounds. 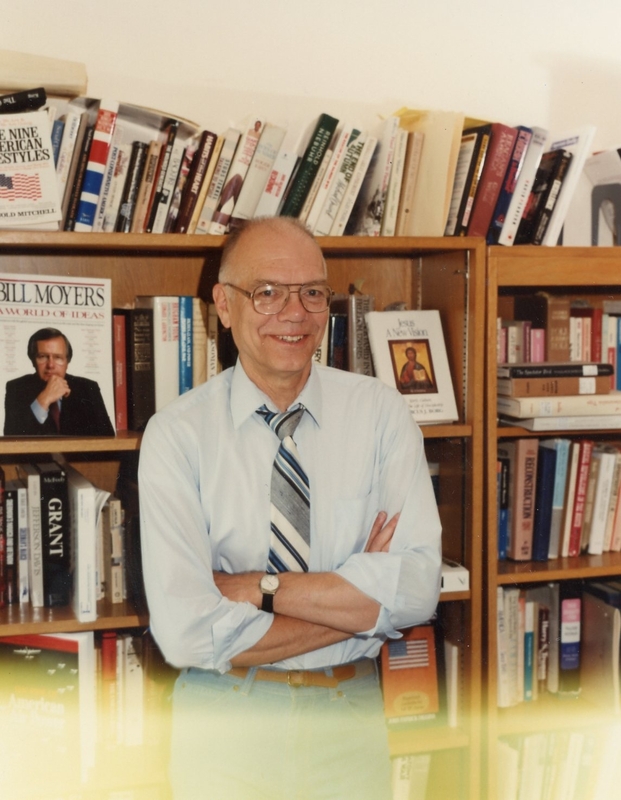 Hu was an Americanist, with a focus on the Civil War, but he also had a great interest in European history, including the Holocaust; in fact, he was one of the charter members of the Holocaust Memorial Committee, which was established in January 1987. This entry was posted in Departmental News, Faculty News, Student News. Bookmark the permalink.